Interior branding is a fantastic tool to communicate your company ethos and identity through the design and layout of a physical location. A critical part of building strong brand awareness is to align all aspects of your business and introducing key elements of your branding provides a powerful experience for both customers and employees. Virtually all businesses understand how important a great logo and website is but forget how the appearance of a generic office or uninspiring meeting place can affect the overall perception. Your interior branding should tell all visitors what your business is about and portray your key messages. The opportunities available to maximise your space are endless. Why is your interior or office branding important? Schools, Colleges & Universities – Transform any corridor, classroom, lecture theatre, common room or staff room. Service Providers – Hospitals, libraries, health centres and public offices all utilise different spaces and surfaces to reinforce relevant information about the services and facilities available. Businesses from Every Sector – Make offices, warehouses, receptions or meeting rooms engaging, interesting places to be, whilst showcasing your organisation’s identity. What are the benefits of combining interior design with your branding? Help employees, customers and management understand your business. Unify organisation culture – especially in organisations where there are multiple locations or buildings. Showcase logo and company values with strategically placed graphics – these can be on wall spaces, windows or as stand-alone features. Better morale – Boost the atmosphere of a staff room or seating area – interior branding offers an opportunity to inform, engage and entertain, in areas where people congregate and may be in that space for a while. With an increasing range of materials and techniques available the creative possibilities are unlimited. To discuss your requirements please contact our team. A company trademark, design or colour can be used throughout all your branded interior. If your business has multiple locations, or different types/uses of space, then it can create a consistent presence or representation in each individual environment. Use the different physical areas of your business to entertain, whilst also educating, your clients as they move about your business premises. Connect your clients with your business/brand through their different senses – sight, smell, hearing, touch – ensuring sensory connections are consistent with your brand and interesting, to engage your clients. There are a number of reasons why you would choose to install Vinyl Wall Graphics instead of the more traditional wall adornments, such as paint or wallpaper. Wall graphics come in semi-permanent and permanent options. As you can use a variety of materials and adhesives for large format wall coverings, you can change the look and content regularly – perhaps cater for seasonal campaigns or special events – or maintain a more permanent, continuous message and presence. Vinyl wall coverings can last up to five times as long as paint under normal conditions. Although they may be slightly more expensive to initially install, wall graphics can result in savings of up to 30% over the lifetime compared with paint coverings. Plus, vinyl wall graphics can bodly display your company logo, colours and even company ethos, slogan or marketing messages. Wall and window graphics are durable and virtually maintenance free. Unlike paint, vinyl wall decals don’t need to be regularly cleaned to maintain a new, clear and vibrant appearance. Any maintenance that is required is catered for with a quick wipe over! Whereas paint can sometimes appear inconsistent, and wallpaper can often look wrinkled and uneven, wall decals will appear smooth and smart throughout their usage. All you need to install a wall graphic are a level, measuring tape and a pencil. No messy paint rollers or wallpaper paste required! Wall and window decals can be re-used. Whereas wallpaper can only be used once, and paint needs regular ‘refreshing’, wall and window decals can be used several times, and in different locations. So, if you move business premises, you can take them with you to maintain the consistency of your brand image, regardless of the location. Wall graphics offer you limitless options – a plethora of designs, colours, shapes and sizes, as simple, or as complex, as your imagination! All sounds a bit ‘hi-tech’ for me! What is it – and what does it do? Digital Wallpaper is a bespoke printed wall-covering – custom printed to your specification, using the latest digital technology, and produced to fit any sized space! So, why is this a good option for your office branding design? 1. You can order just the amount the need – digital wallpaper requires no stock as such, so is ideal for limited production, and therefore you only need to order – and pay for – exactly what you’re going to require! 2. Digital wallpaper can reproduce any image – unlike other traditional wall décor – where colour and design can be restricted – it can be produced in any colour, image or pattern. 3. There is no repetitive wallpaper pattern to follow – any display or image can be produced and is, therefore, much easier to hang/install. 4. Much like the vinyl wall decals mentioned earlier, digital wallpaper offers the opportunity for totally bespoke, customized wall coverings and is, therefore, ideal for creative office branding and office signage. 5. Digital wallpaper will maintain its’ fresh appearance for four to five times longer than paint and will not need to be ‘re-done’, therefore making it, in the long-term, a more financially viable option as well as being original and bespoke. 6. It’s a very fashionable and modern way to display your office signage as it allows for innovative concepts, styles and images to be used to display your company branding and identity. 7. Digital wallpaper also has the advantage of hiding any surface flaws or cracks and is far more durable than a painted option. lat panel signs are a great way to inexpensively brand your business premises front or building. They can be used to advertise a new product or service, or to display information about your business. 1. Lots of different materials can be utilised to produce the effect you want for your signs, from Aluminium Composite or Printed Foamex, through to Printed Perspex or Printed Forex signage. Wall panels are also available in wood, PVC and other composites. 2. A number of different formats can be used – perhaps LCD Panels, giving a bright, vibrant display or to create a video wall. This will produce a big impact – but for low cost! Indoor Posters – High quality printing with distinctive colours and design. Roll-up Banners – Free standing – ideal for reception areas and meeting rooms. Vinyl PVC Banners – Can be displayed to create feature walls. Pop-up Stands – Versatile and mobile, can be utilised in different areas, as and when relevant. Outdoor Posters – Big, bold outdoor posters can draw attention to your business premises to all who walk, or drive, past. Lightboxes or Backlit Graphics – Back lighting behind a large format poster can really stand out and highlight your business in a dramatic way. 1. Guiding clients around your business premises to ensure all the products/services you have are brought to their attention. 2. Separating, and highlighting, different, specific areas/zones of your business premises. 3. Displaying important Health and Safety information and facilities for staff and visitors alike. Working closely on behalf of their design agency Fresh Communications, we were asked to help with the Internal Branding at the University of Birmingham. A range of vinyl graphics and wallpaper were used extensively to create a very modern feel to the interior of the Community Living hub. Derby based Picsolve commissioned us to produce all new internal & external signage for their headquarters. Fret cut aluminium lettering was manufactured for the external face of the building. Internally, a custom fabricated illuminated sign was created for their reception. Working very closely with their creative agency, we helped with the transformation of a brand new Student Accommodation Block in the heart of Nottingham City Centre with all new and innovative Signage and Wayfinding. Through an intensive and thorough survey of the site, we were able to feed the necessary information back through to the designers who were able to put together all of the necessary artwork required. Installation of the signage was handled in-house by our team who worked tirelessly to ensure that all of the necessary elements were ready in time for the building’s official opening. One of our more ambitious and large scale projects saw us initially being invited to pitch to the Ironbridge Gorge Museum Trust at the tail end of 2016. 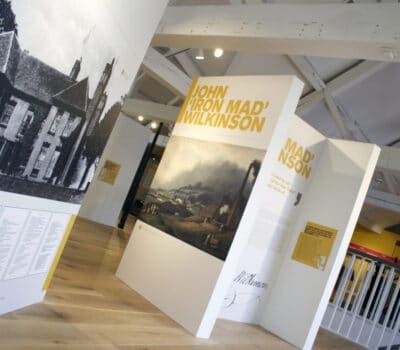 Our brief required us to put forward a proposal to transform their Museum of Iron building with exciting new Signage and Wayfinding materials, as part of their extensive £1m renovation. With a potential 10-year window, the new graphics would need to withstand the hustle and bustle of thousands of visitor’s year on year, whilst looking fresh and up-to-date. Initial design concepts were put forward with variations to layouts, colours and fonts in order to find a platform that the client was happy to go with. All work was designed, project managed and installed by ourselves.